Who are the most famous fishermen? Ever heard the story of the two fishermen who used their dead friend as bait and managed to catch a monster carp? Believe it or not, that is what Cliff Dale and Paul Fairbrass did to honour their best friend, Ron Hopper. Well, every fisherman has a great story, and that’s what makes fishing exciting and fun. Fishing is one of the oldest human activities. Traditionally, it was an act done solely for food and survival. However, it has evolved to become a recreational and competitive sport. Although fishing varies across fish species, location, and the equipment used, there have been many stand out anglers that have graced fishing. From winning international tournaments to making valuable contributions to the fishing sport, these anglers have gained prominence and popularity across the world. They have made fishing an internationally followed sport as well as a multi-billion dollar industry. The following seven anglers may not be the best of all time or the highest scorers in tournaments, however, they are all famous because of their accomplishments, contributions, and the influence they have had across the world. They have shown us that fishing can be a fun activity to participate in and to watch no matter your level. They have become excellent ambassadors for the sport and deserve to be on our list of the most famous fishermen. Along with having a prominent TV show, Roland Martin has had a stellar career in fishing. He is one of the pioneers of the modern bass fishing and was among the first anglers to introduce the idea of patterning fish. With about 19 pro tournament wins, 9 BASS Angler of the Year titles, and several top 10 finishes in the BASS Series, Martin is one of the most celebrated and decorated fishermen in bass fishing. He has hosted many TV shows where he shares tricks and tips for fishing. In addition, he is a strong promoter of conservation amongst anglers and sportsmen. Michael Lerner is one of the greatest and most famous anglers, mostly known for his scientific contributions to the fishing sport. He founded the International Game Fish Association, and together with his wife Helen, organized a variety of fishing expeditions to study various species of fish. His research made invaluable contributions to the saltwater game fish, and these resources became very useful to anglers, scholars, and conservationists. He received several international awards for his immense contributions to the angler community. In addition, he was inducted into the IGFA Hall of Fame for his commitment to the sport of fishing. Gowdy is a legend of sports announcing and has covered several sporting events on television. His career intertwined with his passion for fishing when he learned to fly-fish while working with the Yankees. Since then, he went on to spearhead the establishment of The American Sportsman, the first fishing show on television, hosting over 200 episodes in the process. He has travelled with celebrities, getting to fish in the some of the best fishing spots in the world. As a result of his contribution, he has over 20 Halls of Fame in different fields from different international bodies including IGFA Hall of Fame (2003) and the National Freshwater Fishing Hall of Fame (2005). At number four is the four-time Bass Masters Classic World Champion, Rick Clunn. Having been in the fishing industry for over 30 years, Clunn has one of the longest professional fishing careers. With over 100 top ten finishes and 15 tournament wins, he has had a crazily successful fishing career, hauling over 10,000 pounds of tournament bass. As a result of his success, he was inducted into the Freshwater Fishing Hall of Fame and the Bass Fishing Hall of Fame. On top of his tournament wins, he has 2 WON Bass U.S. Open Championship on Lake Mead, one of the hardest competitions to win. Ray Scott is one of the most recognized anglers, having popularized Bass and founded the Bass Anglers Sportsman Society (B.A.S.S). This group has grown to become the largest fishing organization with over 600,000 members. He changed recreational fishing into a profitable industry by featuring it on TV. Through his shows, he influenced and inspired many anglers to start bass fishing and made people at home feel the joy of fishing. He popularized the black bass with the growth of the sport turning it into the world’s favorite game fish. He was inducted into the IGFA Hall of Fame for his works and pioneering the modern-day bass angling. Coming in at number two is Mike Laconelli. Born in Philadelphia and blend in New Jersey, Laconelli is one of the most recognized fishermen in the world. The BASS Elite Series Angler started fishing at a young age in the Pocono Mountains and grew to become a professional Bass fisherman, starting his own bass fishing club, Top Rod Bassmasters, along the way. Over his career, Laconelli has won many tournaments and awards and is the only angler to win the Bassmaster Angler of the Year, BASS Nation Championship, and Bassmaster Classic. In 2006, the self-proclaimed “power fisherman” was listed by the GQ Magazine among the 10 most hated athletes. Hemingway learned how to fish as a child on the lakes of Michigan, trout fishing with his father. When he grew up, he became a lover of the sea and spent most of his fishing hours in the Florida Keys. He won every organized fishing tournament and is most renowned for catching one of the largest Marlins of all times that weighed 533kg. He loved fishing so much that he almost missed his wedding because he was away fishing. Other than being a prominent fisherman, Hemingway also won a Nobel Prize, Pulitzer award, and is regarded as one of the greatest American novelists of the 20th century. He taught about fishing and has inspired countless people through his literary works, most notably The Old Man and the Sea. 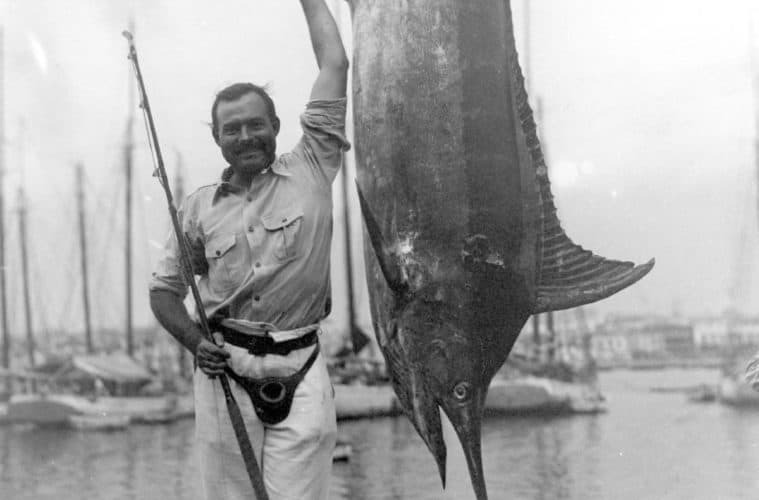 This is why we believe Ernest Hemingway to be the most famous fishermen. True greatness rests, not in one’s individual accomplishments, but in what one has inspired others to achieve. The most famous fishermen are the ones who are not only great at fishing but also in making valuable contributions to the sport and inspiring other anglers. These seven are people who have excelled both with a rod in hand and without. They are a role model for many budding anglers out there. Through them, we have learnt many lessons most notably on the topic of conservation. Like Mike Laconelli and Ernest Hemingway, you too can beat the world, be loved by fans, and inspire other people. Don’t be afraid to try, get your rod, reel, bait, line, and hooks and start today. You too could be on this type of list someday.